Sarah has liked Ryan for years. The trouble is, Ryan is now dating her best friend, Brianna. Sarah knows that crushing on your best friend’s boyfriend is breaking one of the biggest unwritten rules of friendship but, the more time she spends with Ryan and Brianna, the more she realises that she doesn’t want to back away, even though she knows she should. 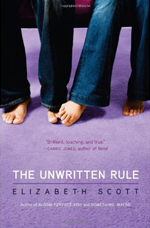 The Unwritten Rule does a very good job of capturing the kinds of emotions involved in having a crush on someone you’re not meant to like and I think that Elizabeth Scott did a good job of making her characters realistic when it comes to being too afraid to communicate due to inexperience and fear. Even more so, Brianna is just spot-on as a study of a teenage girl whose behaviour is entirely influenced by her unhappy home life. I think a lot of readers will dislike her greatly, but I personally found her a very sympathetic character, despite her self-centred behaviour. I think my greatest difficulty with The Unwritten Rule was the fact that I just don’t like infidelity in any form. Scott puts a lot of effort into making it almost seem excusable here, by making both partners cheaters and by emphasising the fact that Brianna isn’t an entirely wonderful friend to Sarah but, in a way, that just made me more uncomfortable with the subject matter. There is always the feeling that what Sarah and Ryan are doing is wrong, but it seems to be portrayed as a justifiable wrong, and that just doesn’t sit well with me. I don’t think it’s okay to cheat, just because your partner isn’t as perfect for you as someone else is and I don’t think it’s okay to betray a friend because she cares more about herself than about you. So I don’t think I’m really the intended audience for this book! All that said, I enjoyed how the novel was written and found Scott’s style extremely fluid. I wouldn’t hesitate to recommend it to readers who aren’t quite as put-off by infidelity and betrayal as I am, because I think it’s a well-constructed book with a lot going for it. As it was, I read most of it in one sitting, and will definitely look out for more of Elizabeth Scott’s books in the future.